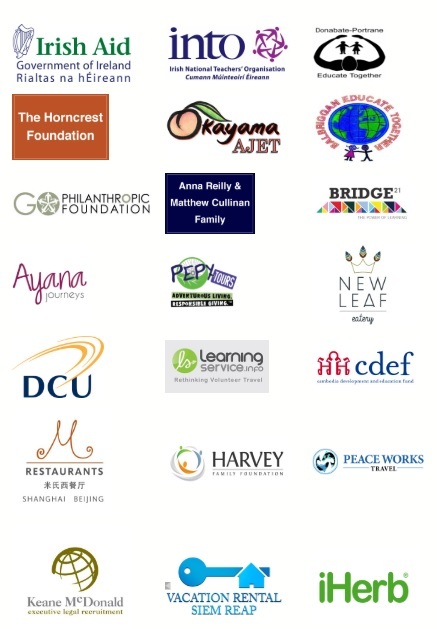 2012 saw the launch of our scholarship program. Since then twenty two students have been awarded scholarships. The bulk of these students complete their first year of studies this October. Over the next eighteen months another forty students from Kralanh will be awarded a PEPY Scholarship. Selecting the students from applicants involves evaluating their academic performance and financial needs . Interviews are used to assess their suitability for the program. Consideration is given also to the students commitment to education, passion for change, and their history of social action. Recipients are supported with educational fees, study supplies, a bike, a computer, and healthcare. The students who arrived in Siem Reap last October to begin their scholarships have been inspired by their new environment and educational opportunities. They have attended university or undertaken vocational training. 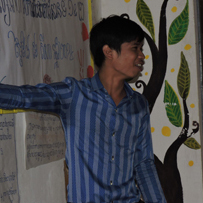 In addition they attend classes in PEPY’s Learning Center. Through the PEPY scholarship program the employment prospects of current scholarship recipients is increased greatly. Young people who complete Grade Twelve can often lack necessary employment and life skills. Particular focus is therefore put on job-specific skills and assisting the students in acquiring future skilled employment. English, ICT, soft skill training and career mentorship are all included. PEPY scholarships are designed to have an impact not just on the students who receive them, but also on their wider communities in Kralanh. The students seek to inspire others and gain an appreciation for what they receive. Through the students an awareness is developed in the communities as to the positive impacts which education can make. The development and profile of education is being enhanced by the students further education and engagement with their communities. The students make presentations in their communities and speak about education, employment and life skills. They act as positive role models for others. These efforts empower the students to be leaders in their communities. Practical thinking skills and leadership skills are developed. In the future the students will earn more money to support their families, reach their goals and keep on giving back to their communities. The scholarship program is not without challenges. Finding suitable accommodation for a large group of students has been challenging. Similarly it has been hard to find a balance in workload for the students, between what they do in the Learning Center and elsewhere. These are lessons for us and we will strive to adapt our future plans accordingly. There are many ways to make an impact on our Scholarship Program. Donations small or big are hugely welcome and make a real contribution to the work we do. 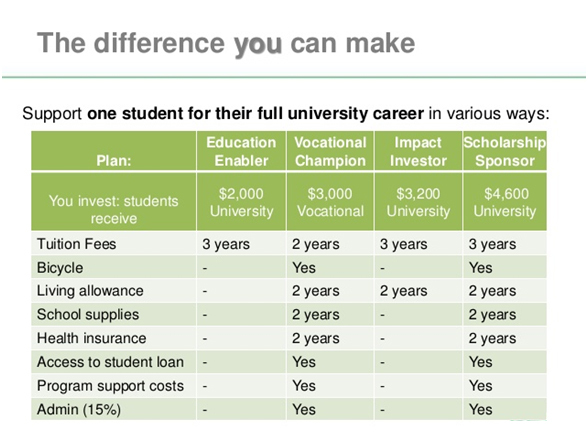 The costs outlined below show the tangible impact you can make. Please remember how during this period of our annual campaign (1st of September – 31st of December 2014) your funds can make double the difference – we are lucky enough to have an anonymous donor who will match funds from new donors. This gives your donation a huge additional impact. Donate today and spread the word!